I have found beekeeping dummy boards to be quite expensive, especially if you use 14×12 boxes like me (approx £7). As a result I have often done without, which has on occasion given me grief of brace comb to the wall, or in other cases a whole new piece of comb handing from the roof. This year I’ve decided I’ve had enough and that I would make some. 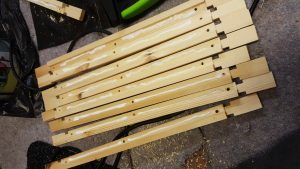 I had spare top bars, so I used those – but you could easily use top bars from old frames, just clean and scorch them (or soak in 1:10 bleach or boil in washing soda) to make sure they are disease free. I used 12mm which is a bit overkill, but was what I had to hand – 9mm is probably best, with rigidity and ability to drill into from above. 3mm will glue on / nail on, but in previous experiments has been very flimsy / prone to damage and warping in practice. more than 12mm will protrude and may not sit flat with the weight. I used marine ply, which will probably last better in the humidity of a beehive . I cut it with a mini circular saw, which left me with a bit of a messy edge, a rasp soon sorted this out. A standard box will fit 12 frames assuming the frames edges are clean; so 11 and a dummy board. If you can’t fit in a top bar, which does not have the spacers on it (Hoffman or otherwise) then you probably have quite a lot of gunk on the spacers on the frames. Scrape them down in your spring clean, and during the year make sure you push them up tightly together after each inspection. You can lever with the hive tool and the box edge to add pressure. If they are packed tight then less propolis/wax will build up on the edges. 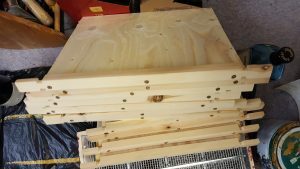 Although a slim dummy-frame is useful when working with 11-frame National hives, dummy-frames in general more usually have a width of around 25mm, so that with a beespace on either side they will then occupy around 35-38mm – the space taken by a brood frame. 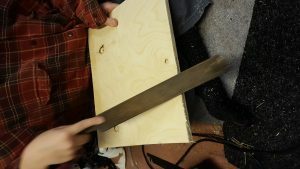 If it’s of interest, methods I’ve been employing for some years now to make both foundationless-brood and dummy-frames are documented at: http://heretics-guide.atwebpages.com/index.html in the section “Turning Firewood into Frames”. That’s a very intriguing site you have there, can’t wait to find out about the thermal dividers next. As to the dummy frames, yes its good to have a bee space on the side nearest the bees, but I like a thinner option than a full frame, because it gives you space to move it away from the bees before lifting it out, so you don’t start you inspection by rolling the bees and upsetting them.